When I was growing up my mother and my closest relatives would always say that “Home is where the Heart is.” I never fully understood what they meant by that. As a young child I was fortunate enough to grow up in a house. Back then there were very few “homeless” people. We had a couple of men in the town who lived on the streets. They were said to have problems both mentally and physically. These issues often found them in front of the local liquor store asking patrons to help support their thirst. Times have certainly changed dramatically from when I was a child. Now the numbers of those who are “homeless”are in the thousands. New York city tops the list at over 60,000 people without homes. 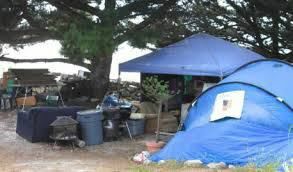 But what we deem as being homeless is really about being without permanent shelter. I say this because, if you look at or are able to observe someone who is “homeless”, you will notice that they have almost everything anyone else would have. There are people without permanent shelter who have pets. Yes, I mean dogs and cats that they keep on a leash and walk several times a day. These people who are ” homeless” actually share a lot in common with the rest of us. They want stability for the most part. That is why they erect tents and lean-to’s as a way of escaping the inclement weather. In some cases they live in the same place for quite a long time. They acquire the same amount of “things ” as the rest of us do. In some cases they probably acquire more than the norm. They do not view themselves as being without, for with the items they accumulate they often can trade or barter for something else they may need.